Narrator: Oh, Katrina, my love. Who can resist your grace, your charm? And who can resist your father's farm? Narrator: Boy, what a set-up! There's gold in them acres, and that ain't hay. Not to mention all that lovely green stuff! Dear Katrina, my love, my treasure. Treasure? Ah, that barn's a gold mine. How I'd love to hit the jackpot. Sweet Katrina, Papa's only child. Papa? Well, the old goat can't take it with him, and when he cuts out, that's where I cut in. Cyril Proudbottom: Now the Guv'nor is not a bit stingy, he never does anything small. The weasels gave him the red motorcar, and he gave the weasels Toad Hall. Narrator: Mania, that's it. That's what it was, a positive mania. No telling where it would end, either; it may linger for months, and with Toad Hall at stake. Narrator: Well, they had no choice. There was only one thing to do: lock the poor chap in his chamber and keep him there until the poison worked out of his system. Mole: [after Toad stops] That's better. Rat: [to Toad] And you can't escape, you know. Simply no use trying. Mr. Toad: Let me outta here! Open up! Open up, I say! Please, Ratty, Moley, open the door! Narrator: Now, of course, playing jailer to one's dearest friend wasn't much of an enjoyable experience. In fact, Moley weakened right at the start and wanted to call it quits, but Ratty said, "No. Definitely not." This time they must be firm. After all, it wasn't just a matter of saving Toad from himself. There was MacBadger to consider, and Toad Hall and all that it stood for. Narrator: Man, I'm getting out of here! Narrator: Next morning, Ichabod's hat was found, and close beside it, a shattered pumpkin, but there was no trace of the schoolmaster. It was shortly thereafter that Brom Bones led the fair Katrina to the altar. 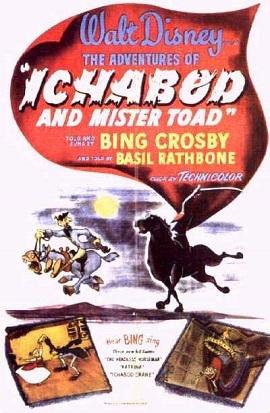 Now, rumors persisted that Ichabod was still alive, married to a wealthy widow in a distant county. But of course, the settlers refused to believe such nonsense, for they knew the schoolmaster had been spirited away by the Headless Horseman. Brom Bones: I'm telling you, brother, it's a frightful sight for what goes on Halloween night. Angus MacBadger: [whispering] Careful, lads. There's a guard. Mr. Toad: [shouts] I'll pop him off! Prosecutor: As trustee of the Toad estate, were you aware of the defendant's mania for motorcars? Prosecutor: And that, due to his reckless behavior, you had cut off his allowance? Prosecutor: And that he was, to the best of your knowledge, without funds? Prosecutor: That is all! Thank you. Narrator: News of Toad's disgrace rocked the nation. It seemed the courts were trying to make an example of him. Of course, his friends tried to help, but they were blocked at every turn. Why, they must have reopened the case a dozen times. They appealed to this court, that court, any court, but the decision stood: the case of J. Thaddeus Toad was closed. Judge: The witness may testify in his own words. Cyril Proudbottom: [in court] Right-o, guv'nor; now, I'll give you the facts of the case. For when Toady escaped from his boudoir, he'd come headin' straight for my place. Soon we was off down the 'ighway but hadn't gone far, I confess, when all of a sudden with a rush and a roar, something passed like the London Express. It was big, it was red, it was beautiful: a motorcar! Hee, a bit of alright; Toady was transfixed with, uh, rapture. You could tell it was love at first sight. The motor pulled up to a tavern wherein was located a bar and we watched while some tough-looking weasels got out of that lovely red car. Now weasels, I know, are deceitful and not to be trusted at all... but how I could know they'd stolen that car? I didn't have no crystal ball. And the guv'nor, he's not one to dally, he'd made up his mind like a flash, he says "try it for size, my good Cyril, while I see what they'll take for it, cash!" So into the tavern he saunters, where the barman was back at the bar. And he said, "Cheerio, tavern-keeper! Who's the owner of that, uh, hot-looking car?" The barman, a codger named, uh, Winky, leaned over the bar and said "Why?" The guv'nor answered "That car must be mine! Whatever the price is, I'll buy!" But Toad found he hadn't no money... so he promptly offered a trade; the weasels appeared to be willin', in a moment, the bargain was made. Then Toady drawed up a paper with almost incredible speed and he called on ol' Winky to, uh, pop over and witness the deed. Now the guv'nor's not a bit stingy, he never does anything small: the weasels gave him the red motorcar, heh, and he gave the weasels... Toad Hall! Mr. Toad: A motorcar! Gad... what have I been missing? Mole: Ratty! It isn't. He hasn't! Rat: It is, and he has it: a new mania. Motor mania! Mr. Toad: I want you fellows to meet my noble steed, Cyril. Cyril Proudbottom: Aye, that's me. Chorus: Who's that walking down the street? Narrator: Are those shovels, or are they feet? Mr. Toad: Gad! What is it? Cyril Proudbottom: Lumme, Guv'nor! It's a motorcar. Mr. Toad: A motorcar. Gad! What have I been missing. Narrator: Yeah, J. Thaddeus, quite a lad. Speaking of fabulous characters, England has produced a bumper crop of them. But don't forget, over here in the colonies, we've managed to come up with a few of our own. How about Paul Bunyan, Pecos Bill, Johnny Appleseed, Black Bart, Davy Crockett, Daniel Boone and, of course, the one and only Ichabod Crane. Old Ichy, if you recall, was the country schoolmaster dreamed up by Washington Irving. Oh, he had a way with the yarn, good Mr. Irving. Mr. Toad: [in court giving his defence] Are you familiar with the defendant J. Thaddeus Toad? Cyril Proudbottom: Lord love a duck, yes! He's one of the jolliest chaps I've ever run across! And simply tons of money! Prosecutor: [to Cyril] Good fellow, eh? Throws it away... But he wasn't throwing it away that day! You heard Mr. McBadger's testify that his allowance was cut off! Then how did he get the motorcar? Cyril Proudbottom: The only way a gentlemen gets anything; the honest way. Prosecutor: And what is the honest way? Cyril Proudbottom: Haha, I thought you wouldn't know that one, guv'nor. Mole: Why... it's a poor old lady. Let's move her over by the fire. Rat: Oww! Toad! What are you doing here? Mole: Well, this is a merry Christmas... but aren't you afraid of the police? Mr. Toad: Afraid of the police? Mr. Toad: I? Toad? Afraid of the police? Angus MacBadger: [from behind the door] OPEN UP! OPEN UP, I SAY! Narrator: Don't try to figure out a plan. You can't reason with a headless man. Brom Bones: Odd's Bodkins. Gad zooks. Take a look at that spook of spooks. Narrator: Now there was one problem with Ratty's cure for motormania... it didn't work. Mr. Toad: [to the courtroom] Milord, gentlemen, facing you in the witness box is a citizen of substance and stance; a man of unimpeachable honesty. Mr. Toad: Now, Mr. Winky, do you recall an incident that took place in your establishment about August 12th that I was a party to? Winky: Oh, yes, sir. That I do, sir. Mr. Toad: Well, then, just tell the court what actually happened. Winky: Well, gov'nor, you tried to sell me a stolen motorcar. Angus MacBadger: Oh, it's you, Rat. And Mole, too. Thank goodness, lads. You've come at last. Angus MacBadger: I'm feelin' like a nervous wreck. Rat: I say, MacBadger, what seems to be the trouble? Angus MacBadger: [upset] Something's got to be done about Toad! This time, he is goin' too far! Mole: But he promised us. Angus MacBadger: Promises? Ha! What good are his promises when these wild manias take him? Now look, you're his dearest friends, are you not? Angus MacBadger: Then, lads, you've got to find Toad and stop him. Angus MacBadger: He's got a new mania. He's rampagin' about the county in a canary yellow gypsy cart with a horse named Cyril. Rat: Toad, we want to have a talk with you. Mr. Toad: Oh, a visit? Splendid. Rat: Toad, this is serious. You've got to give up that horse and cart. Mr. Toad: [in disbelief] Give up my... Oh, but my dear Ratty, this is my career. Surely, you can't mean it. Rat: I do mean it. You've got to stop this foolishness. Mr. Toad: No, I won't do it! Rat: Your reckless is behavior is giving us animals a bad name. Mr. Toad: I won't listen to anything! Rat: Your thoughts are becoming a menace to society. If you won't think of yourself, then think of poor old MacBadger. And as for that horse, no good could ever come from galloping about with such a fast and irresponsible beast. Narrator: If you were asked to choose the most fabulous character in English literature, who would it be? Robin Hood? King Arthur? Becky Sharp? Sherlock Holmes? Oliver Twist, perhaps? Well, any one of them would be an excellent choice. Still, for the most fabulous character of all, I would nominate... a toad - J. Thaddeus Toad, Esq. Have you ever met him? You'll find his story in this delightful little book, "The Wind In the Willows". Toad, you might say, was the one disturbing element: incurable adventurer, mad, reckless, tried everything, positive mania for fads, and he never countered the cost. Had a host affair with friends, of course, but there were only three who had his best interests at heart. One was a badger, MacBadger. Another was a water rat; a bit stuffy, perhaps, but really a fine fellow. And a mole; gentle creature, kind and sympathetic. The Headless Horseman: [evil laugh] YAHAHAHAHAHAHAHAHAHAHAHA! Brom Bones: [singing] When the ghosts have a midnight jamboree/They break it up with fiendish glee/Ghosts are bad, but the one that's cursed/Is the Headless Horseman; he's the worst! Additional voices: [singing] That's right, he's a fright on Halloween night! Brom Bones: When he goes a-jogging across the land/Holding his noggin in his hand/Demons take one look and groan/And they hit the road for parts unknown! Additional voices: Beware, take care; he rides alone! Mr. Toad: Come along! Hop up here! We'll go for a jolly ride! The open road! The dusty highway! Come! I'll show you the world! Travel! Scene! Excitement! Ha ha ha!